The bottom of the cage is 100% leakproof, so you can be sure that no liquid will ooze out. In addition, the bottom tray is removable, which simplifies maintenance. The bottom sides are rather low. 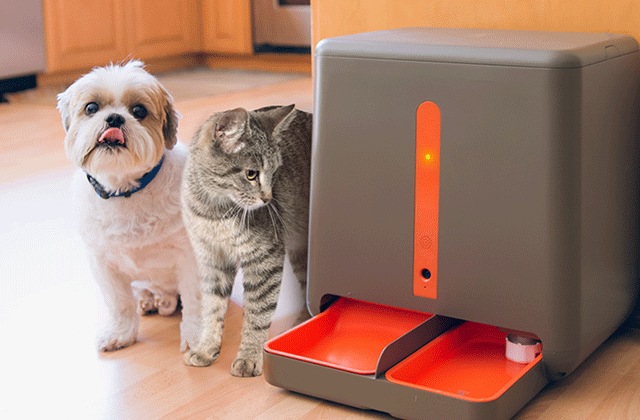 The Petsfit hutch is good-looking, nice-smelling, and substantial enough for daily use. 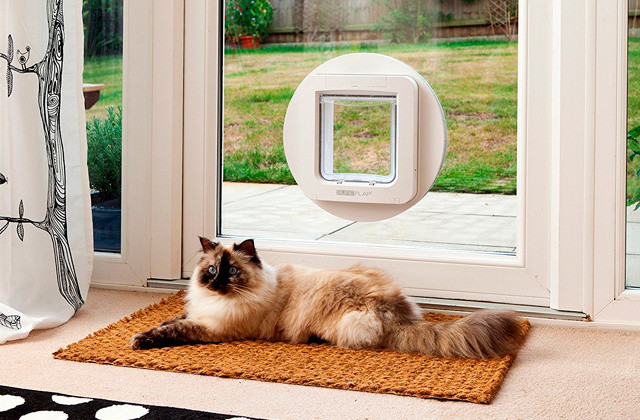 It's divided into two zones to provide your pets with some space to sleep or have privacy. It can fit 1-2 normal grown up rabbits. 33.8" x 38.2" x 19.6"
The animal cage features as many as 5 tiers that are connected with ramps, which allows several pets at a time to climb and rest. The ladders are a bit complicated to attach. This is a real climbing tower for the most energetic ferrets. 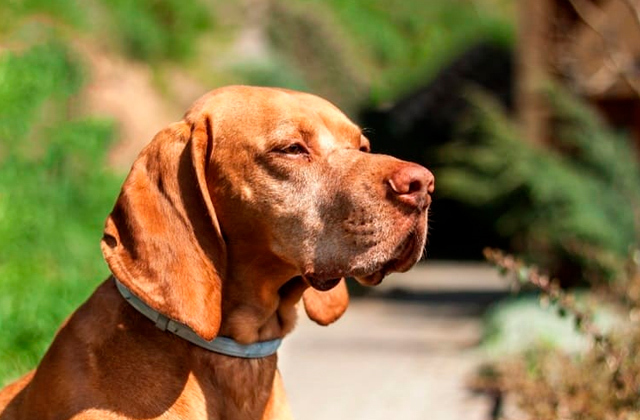 It offers ample space to play and rest for several pets. As a nice touch, it comes with an 8.5oz water bottle and plastic food box. 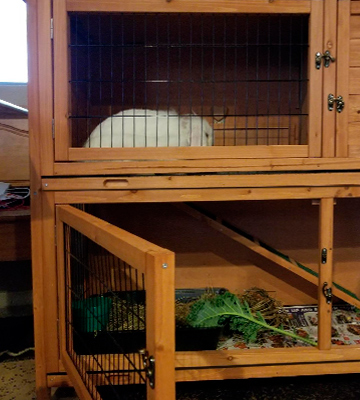 51.6" x 25.2" x 16.9"
Similar to a bunk bed, this one consists of two cages stacked on each other - the hutch has two separate rooms that are connected by a ramp. 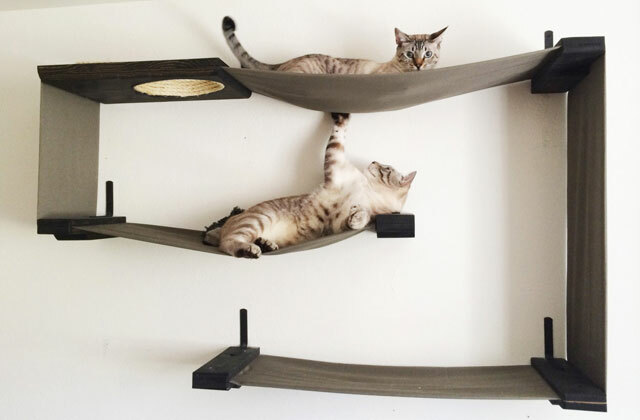 Excellent for 2 pets. No written manual to explain how to put everything together. 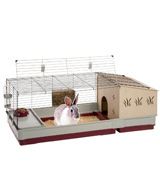 This spacious wooden house can really deliver a good life to your bunnies. 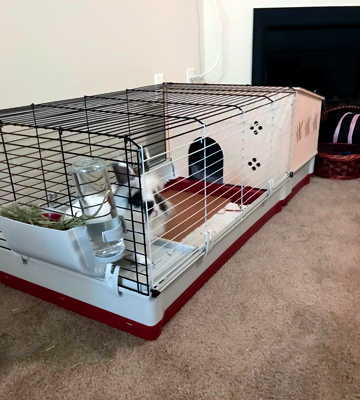 With plenty of “look out” areas and room to rest and play, it's the best indoor rabbit cage for a few small animals to live in. 41" x 45" x 19.7"
It comes fully accessorized for your pet's comfort. The set includes a hay feeder, drinking bottle, bowl, and a separate wooden enclosure (can be attached optionally). The water bottle fastens a bit loosely to the cage. The Ferplast Krolik 140 cage has a very thought-out design. It has everything to make life easier for bunnies and their owners. It’s huge, so rabbits will feel like they are living in a mansion built especially for them. 23.6" x 55.9" x 19.7"
The hutch is made from fir wood and coated with waterproof non-toxic paint. That's why it's a versatile option to keep inside during cold months and take outside during summer days. Rabbits might chew a nesting wooden box. 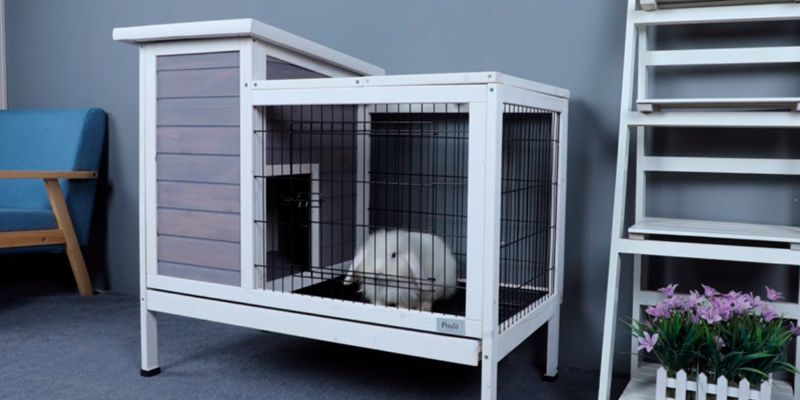 Thanks to the classic design and sturdy wood construction, the Petpark hutch can become not only an excellent shelter for your rabbit but also a great decoration for your room or patio. 30" x 36" x 22"
When it comes to choosing a home for small furry friends, it should be safe, eco-friendly, spacious and sturdy enough to stand up to everyday use. That's exactly what you get with the Petsfit Rabbit Hutch. This cage is very stoutly-built from an environmentally-friendly cedar wood and is designed with iron wire to withstand all the abuse your feral babies can put it through. The cage is easy to put together if you follow all the directions. The packaging is neat and organized with step-by-step instructions included. Once assembled, the cage looks absolutely darling. It's nice and spacious enough for 1-2 normal grown up rabbits. Besides rabbits, it can fit guinea pigs, hamsters, and other small animals. 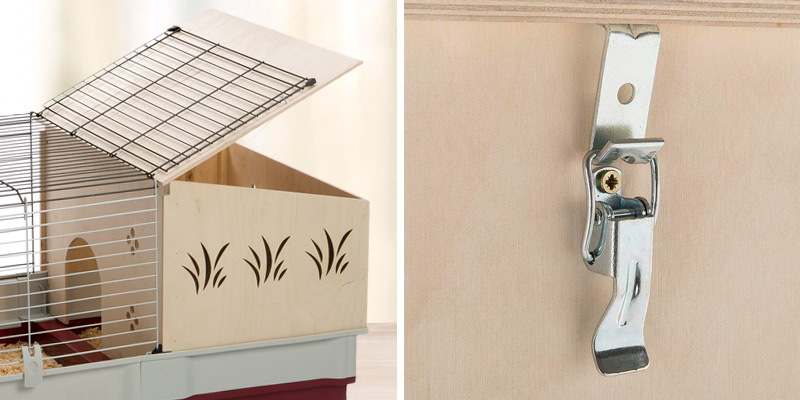 Designed with a pull-out tray, the hutch is really easy to clean. The pull-out metal sheet bottom fits into a trash bag, so you can simply pull it out, dump it, and wipe it down. And the best part is that the bottom is 100% waterproof (if it leaks off, the company guarantees to send you a new one). 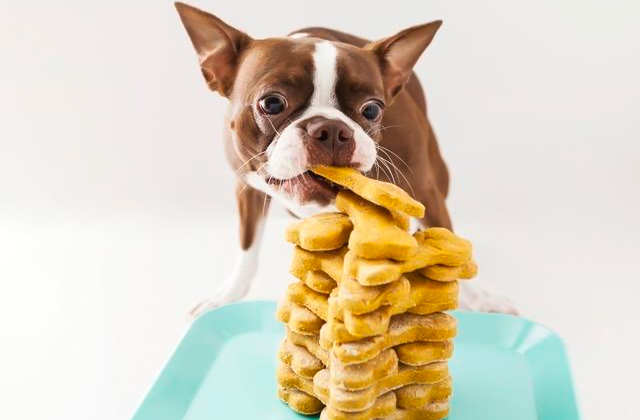 The only problem you may face is that the sides might be a bit too low for your furry friends - if they like digging while playing, they can kick out a lot of bedding from the cage. However, there is a solution to that. 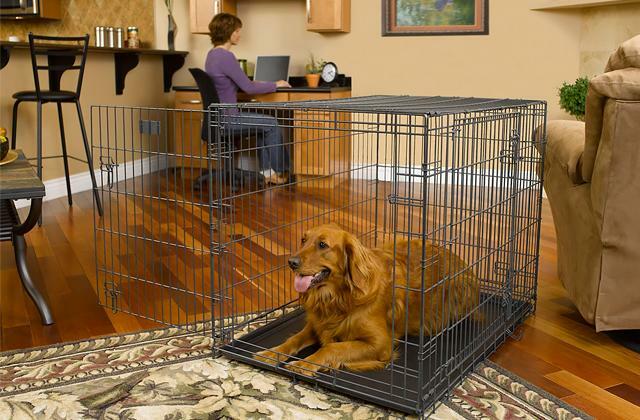 If you have an extremely active pet, you can use plastic guards (not included in the set) with the hutch. We believe this small modification is worth it. The hutch is good-looking, nice-smelling, and substantial enough for daily use. 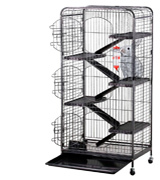 Looking for an extra roomy cage that would provide plenty of space for ferrets to play? The Yaheetech 52” animal hutch may be the perfect match. Being as big as 25.2" x 16.9" x 51.6", this is a real climbing tower for the most energetic ferrets. 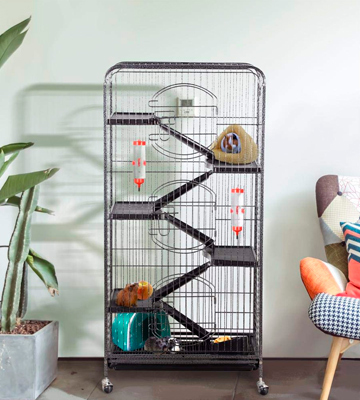 The cage features 5 tiers that are connected with ramps, which allows several pets at a time to climb and rest. 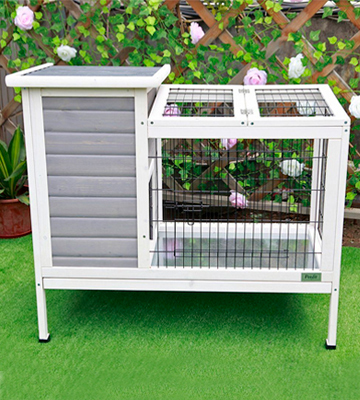 The cage is great for rabbits, hamsters, squirrels, chinchillas, ferrets, and rats. However, take note that it's best suitable for average-sized rabbits. 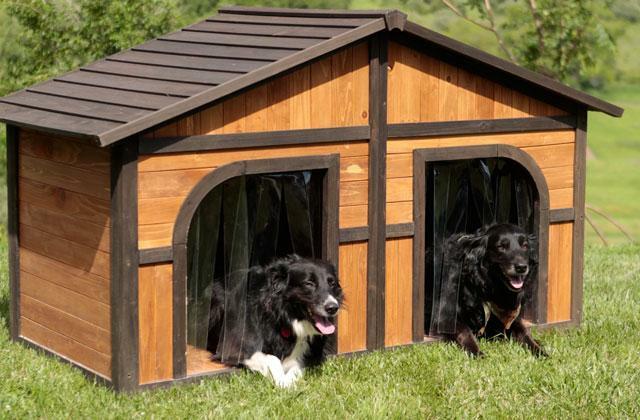 This luxurious villa for pets is made with safety in mind. The ramps are designed with convex figures that increase the friction and prevent animals from slipping while climbing. And thoughtful 0.9'' bar spacing prevents them from being caught or stuck. The cage itself is very sturdy. It's made of fully-painted metal frame and features round corner design with no sharp points. It has 3 arched doors for full access and all of them are secured with latches. For easy cleaning, it comes with a slide out-tray. What is notable, the mesh panel between rabbits and the tray makes it impossible for your pets to walk or lay directly on their poos. 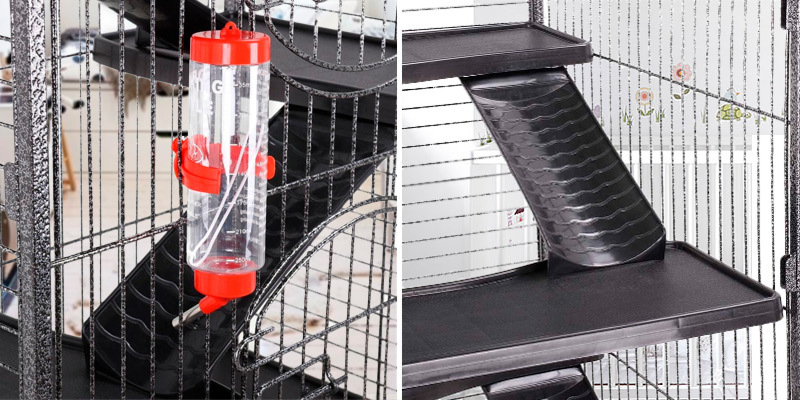 This design solution ensures your ferrets' hygiene and the tidiness of the whole cage. On the bottom, there are 4 caster wheels for added stability and durability. They rotate in all directions, which allows you to conveniently move the cage around if needed. All this makes the cage ideal not only for homes but also for pet shops and pet cafés. 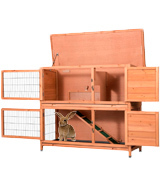 If you're in the market for a spacious wooden cage for your bunnies, take a closer look at the Good Life Two Tier hutch. As the name suggests, it's a multiple-story rabbit home that offers enough space for two pets to play and rest. Similar to a bunk bed, it consists of two cages stacked on each other - the hutch has two separate rooms (one above and one below) that are connected by a ramp. Take note that the top portion seems to be a little darker than the bottom portion, hence it would be more suitable for naps. And the bottom tier could become a perfect place for feeding, as there is ample room for additional items like water bottles and feeders. For easy access, there are 2 doors on each level. The house is made from very strong and sturdy cedar wood. It goes together easily since everything is pre-drilled for quick assembly. The only drawback is that there is no written manual to explain how to put everything together. Yet, the directions have pictures, so we bet you won't have difficulties with the assembly. Once set up, the house looks durable and stable. 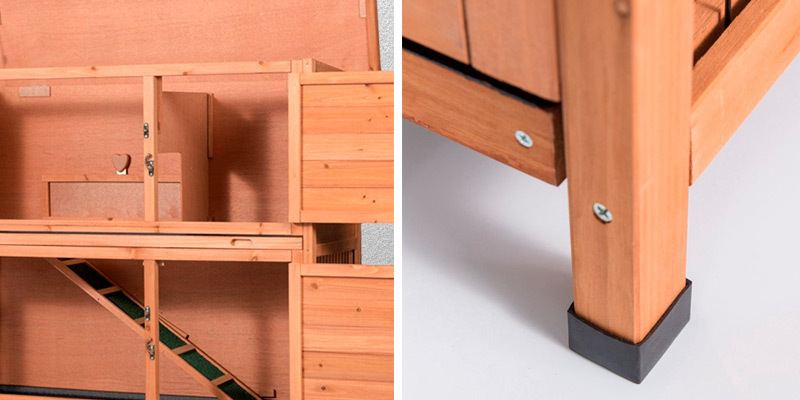 The hutch is featured with raised legs that keep it off ground. So, if you're planning to store it outside, you can rest assured knowing that unwelcome pests won't be able to enter. Bad weather won't be a problem either, thanks to the asphalt shingled roof preventing the rain from getting inside the cage. 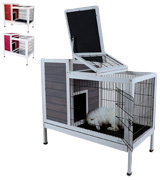 All in all, this double indoor rabbit cage can really deliver a good life to your bun. With plenty of “look out” areas and plenty of room to rest and play, it's the best indoor rabbit cage for a few pets to live in. The Ferplast Krolik habitat boasts an innovative design and all the features to meet the natural tendencies of rabbits. 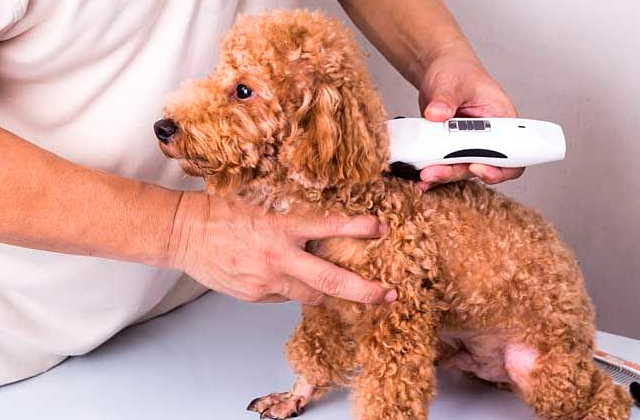 For starters, it comes fully accessorized for your pet's comfort. The package includes a removable portion with useful steps, which has a large shelf on the top where you can place a feeding bowl (included). Also, there is a feeder for hay in the package, which is easy to put on the side of the cage. Last but not least, the manufacturer has even packed a 600-cc drinking bottle in the box. The water bottle has a useful indicator of liquid level and an anti-drop steel valve. The only complaint is that it fastens a bit loosely to the side of the cage. So, smart rabbits might figure out how to knock it down. The main strength of the Ferplast Krolik habitat is the innovative knock-down design making this cage very convenient in use. It's supplied in a knock-down kit and can be disassembled/ assembled in a matter of minutes. Apart from being extra simple to set up or fold down, it takes very little space when not in use. Hence, it can be carried with you on many different occasions. And the great features do not stop here. Also supplied with the Krolik 140 Plus is an extension that you can attach to the cage when you want to provide your pet with additional space. 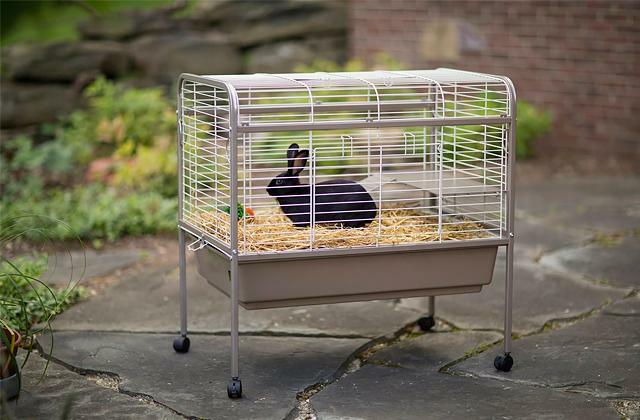 This extension can work as a resting place, protected shelter, privacy area, or a separate zone, and be especially useful when you need to separate male rabbits from babies or injured animals from other rabbits. Summing up, it's a great cage that has a very thought-out design. It has everything to make life easier for bunnies and their owners. It’s really huge, so rabbits will feel like they are living in a mansion built especially for them. The Petpark Rabbit Hutch is carefully crafted from fir wood and coated with waterproof non-toxic paint. Plus, the hutch features a protective roof covered with asphalt shingles so as not to admit moisture or excessive sunlight inside. That's why the Petpark Rabbit burrow is a versatile option to keep inside during cold winter months and take outside during warm summer days. And thanks to the unique high-foot design, you may have peace of mind knowing that no outside predators will penetrate inside. Additionally, high legs will protect your small furry friends from the moisture infiltrated by the ground. Made with clearness in mind, this hutch has a removable bottom sliding tray. 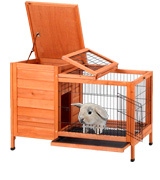 For easy access to your bunny and his supplies, it features multiple doors and a hinged roof. As you've probably noticed, the hutch consists of a wire cage for ventilation and a wooden box for sleep. 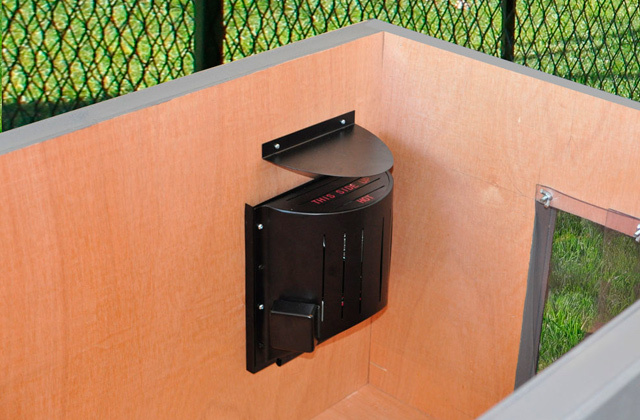 The nesting box will provide your rabbits with some space to have privacy. However, if you own an avid chewer, the nesting house might turn into a large snack he can sleep in. That's why we wouldn't recommend this hutch for bunnies who like chewing. 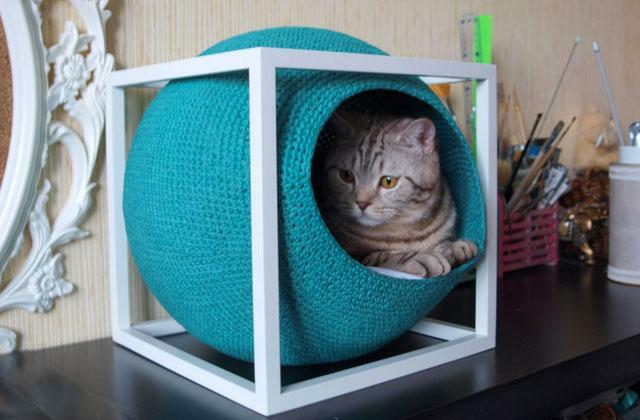 But if that doesn't go for your pet, you'll probably have nothing to dislike about this house. 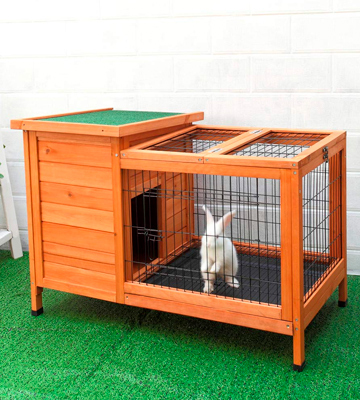 Thanks to the classic design and sturdy wood construction, this hutch can become not only an excellent shelter for your rabbit but also a great decoration for your room or patio. What Is a Rabbit Indoor Cage? If you already own or just think about purchasing a nice fluffy rabbit, you probably know that you should first and foremost provide it with a suitable living environment. The comfy cages from this review are up to the task. For this comparison chart, we have selected only the best indoor rabbit cages that will meet all the physical and mental needs of a bunny. Some of them are suitable for indoor use only, while others can be taken outdoors in warm weather. Yet, all of them are spacious enough to provide various breeds of rabbits with a place to play, rest, and eat. That said, some cages already come with food trays and water bottles ridding you of the need to purchase them additionally. 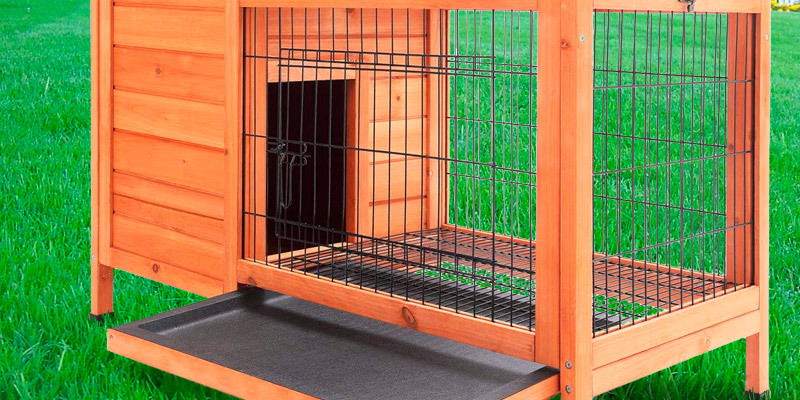 Just in case you haven't found the ideal cage for your bun in this review, we offer you another selection of rabbit hutches. 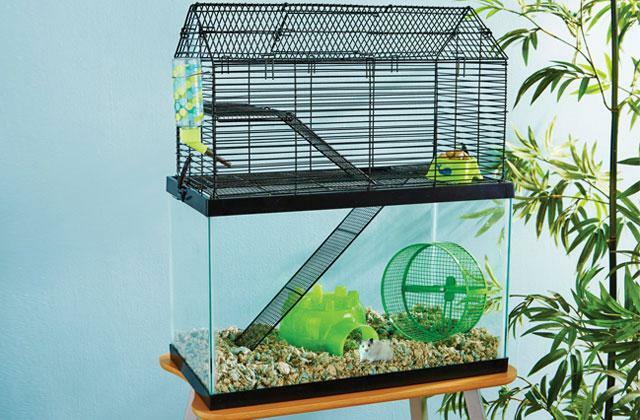 And if you're looking for a cage for your hamster, you can check the top hamster habitats here.